It all started with one painting. This one. 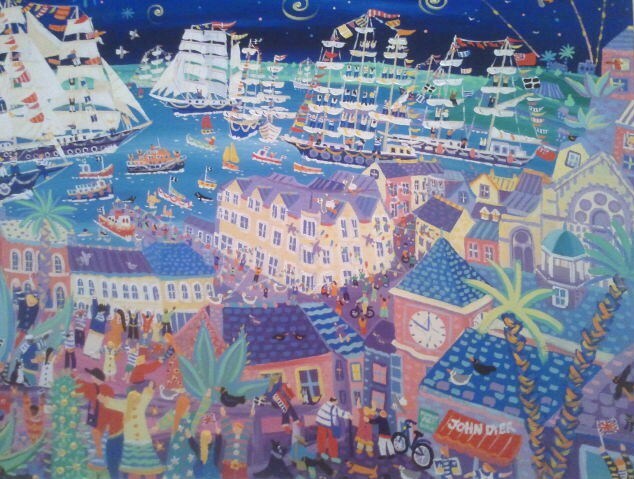 It’s by Cornwall-based artist John Dyer and is called Tall Ships and Small Ships. It’s the official image for the Falmouth Tall Ships Regatta, which takes place 28-31 August 2014. It’s also the inspiration behind the The Big Art and Storytelling Tall Ships Project, a national children’s art and writing competition and exhibition. The project’s been awarded funding from The Arts Council and local arts funding body FEAST. I was lucky enough to be chosen as one of four up and coming writers in Cornwall to be awarded a bursary to write a new piece as part of the project. The brief was simple: to write a creative response to John Dyer’s painting. I went along to the Falmouth Art Gallery to take a look. Close up, the colours are vibrant, and a smile crept across my face I sat in front of it. The characters seemed to leap off the canvas, almost as if they were vying for my attention. “Write about me!” they called. I could have written a whole collection of stories inspired by it. In the end, it was those who first caught my eye that I chose to write about – a girl sitting on a rooftop playing the accordion to a black and white cat. You can read my story, Operation Accordion online or download it from the website. As part of the project I also ran a writing workshop with a group of Y6 children from a local school at Falmouth Art Gallery last week. It was a privilege to work with such enthusiastic, talented children and share my love of writing and storytelling. Lots of them were keen to finish the stories they started in the workshop and enter them in the competition. All the stories entered in competition will be be posted online, so I’m looking forward to reading them. The competition closes on 1 August, so if you know any budding young artists or writers, there’s still time to for them to take part.